Here’s a warming low-carb soup for chilly days! Warm olive oil in heavy medium pot over medium-high heat. Add broccoli stems and sauté about 6 minutes. Add garlic, onion powder, thyme, mustard, white pepper; sauté 1 minute. Add stock; bring to boil. Simmer uncovered until broccoli is tender, about 15 minutes. Using an immersion blender, puree the broccoli. Stir in cream (zero carbs, thicker) or milk. Add broccoli florets. Simmer until florets are tender, stirring frequently, about 5 minutes. Dump most of the soup into a food processor, reserving a few broccoli florets, and pulse until smooth. 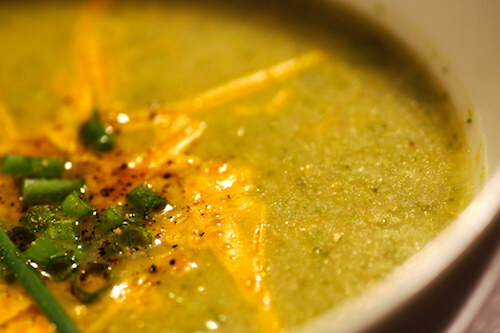 Add reserved broccoli pieces back to the soup and reheat. Preheat broiler. Place 4 ovenproof soup bowls on baking sheet. Divide soup among bowls. Sprinkle 1/2 cup cheese (or more, it’s SO tasty!) over each. Broil until cheese melts and bubbles around edges, about 4 minutes. If you can afford an extra 2 carbs, serve with my low-carb biscuits. Note: I like to use Kerrygold cheddar, but I also love to use up bits and pieces of good cheeses—Example: tonight’s soup topping had a mixture of Kerrygold cheddar, Gruyere, and Parmesan-Reggiano. This entry was posted in Eggs, Dairy, Low Carb, Soups, Stews, Stocks on September 19, 2018 by Blackberry Season.